Serviceable Bulk Head Fittings available in 2" and 3". All Units include flow control, shipped inside. "D" Ring gaskets on covers. ASHLAND© PolyTrap© grease traps can be installed above ground sitting on the floor, or flush to the floor in concrete. The units are produced in a variety of sizes to satisfy virtually all requirements. Custom units available up to 350 gpm. Our poly grease traps and grease interceptors are designed and engineered with a specially compounded material that out performs other plastic materials and steel units in most severe applications. All units include removable baffles. Low shipping costs compared to steel units. Lightweight, easy to handle and install  yet durable and sturdy to withstand the most rigorous applications of the plumbing industry. Matching cover with recessed bolt holes and stainless steel screws. HD diamond plate aluminum overlays available for heavy traffic areas, please call. All products can ship via UPS ground or overnight. Superior to metal, fiberglass, or specially treated materials that are promoted as "preventing corrosion". Poly Traps grease traps include a completely integrated surface guaranteed not to corrode, chip, peel or leach. High value for you. Special Order Extensions are available for units to meet grade level. 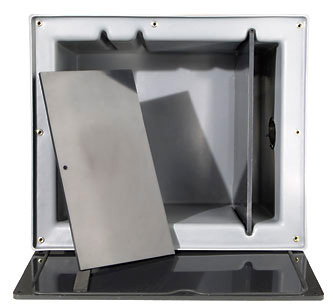 The Poly Trap/Interceptor grease traps are produced in a variety of sizes to satisfy virtually all requirements. Standard units ship same day.